"41AN38, 91, 2" by Timothy K. Perttula and Robert Z. Selden Jr.
DECORATION: The rim is divided into six panels by sets of vertical engraved lines. Each panel has unique engraved motifs that feature—in varying combinations—circles or ovals, semi-circles, hooked arm scrolls, pendant triangles, and hatched ovals. All these elements are commonly featured on upper Neches River Poynor Engraved vessels, but not in the combinations represented on Feature 91, Vessel 2. Moving from left to right on the vessel, the first panel has two semi-circles, with small hatched pendant triangles on the outer semi-circle. The second panel has a central oval with hatched pendant triangles, as well as two semi-circles, one of which has pendant triangles; there also is a small triangular element with a negative oval opposite the central oval. The third and fourth panels have hooked arm scrolls with hatched pendant triangles. Where they differ is that the third panel has two semi-circles in one corner of the panel, while the fourth panel has three hatched pendant triangles. The fifth panel has two opposed hooked arm scrolls with hatched pendant triangles, a connecting engraved line from one scroll to the other, a hatched negative oval, and semi-circles pendant from the second of the hooked arm scrolls; the outermost semi-circle has hatched pendant triangles. The sixth and last panel has a large semi-circle—with smaller engraved semi-circles within it—and hatched pendant triangles on the outside of the large semi-circle. TYPE: Poynor Engraved vessel, local variety 3 at the Lang Pasture site (Perttula 2011:Figure 6-29c). 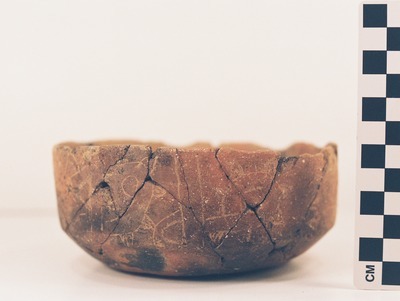 Poynor Engraved carinated bowl, local variety 3, from Feature 91 (Vessel 2) at the Lang Pasture site.